We Took the Road Less Traveled: I'm Ready For My Close-Up, Mr. DeMille! Believe it or not, our little impromptu trip to London was not really intended for my birthday. In fact, it wasn't really something we had planned to do this year at all. During my almost 2 month visit back to the states, I stumbled upon a post from a website I follow on Facebook. It caught my attention, mostly because they were talking about Michael Bublé...one of my most favorite singers. The post I speak of was in regards to Michael filming a "Home For Christmas" show in London and this company, called SRO Audiences, needed warm bodies to fill their audience seating for the taping. GASP! I immediately clicked the link, entered my name into the ticket drawing, and crossed my fingers. Then my curiosity got the best of me, so I Googled SRO Audiences to see who and what the heck they were (I know, in hind sight, I probably should have done that PRIOR to entering the ticket contest, but I like to live on the edge). 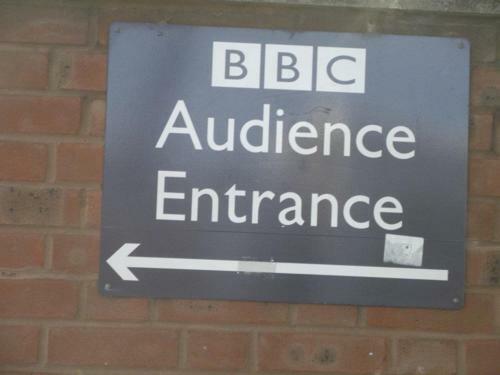 SRO Audiences is a company that fills BBC and ITV tapings with lively audience members. I mean, what good is a TV show taping without a few amped up celebrity stalkers? As I scrolled through the list of upcoming TV shows they were filling seats for, I noticed big bold letters that read "AMERICANS, WE NEED YOU!" Um, hello!! They needed me. Who can say no to bold typeface...they were practically screaming at me. So, I clicked. 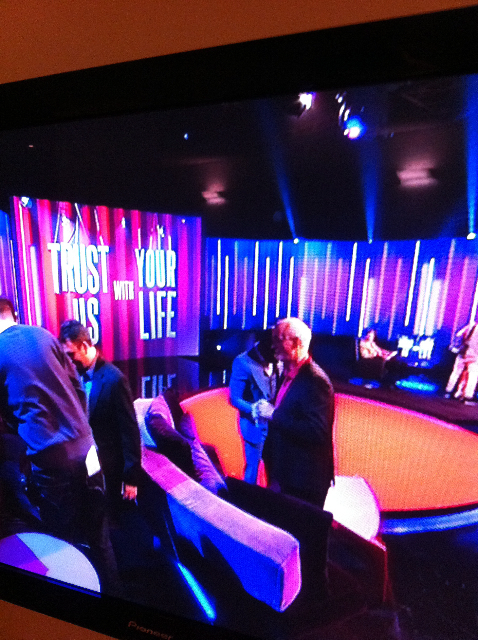 What I had clicked on was call for all Americans (who were in London, of course) to be audience members for a taping of an American improv show called Trust Us With Your Life (from the makers of Whose Line Is It Anyway?) to be shown during primetime on ABC. HOLY JACKPOT BATMAN! Can you guess what I did next? Yep, I entered to get tickets to that taping too! No biggy, because it was the exact same weekend as the Michael Bublé thing. I could totally see D and I TVing it up all weekend in London. So, I waited. Like 4 days. Then, I opened my email and noticed a lovely letter from SRO Audiences offering me 2 tickets to the Trust Us With Your Life taping! Cue squeals! I immediately called D and told him our awesome luck (because this kind of stuff seriously never happens to us). He was stoked and said, "Book it!" That was all I needed to hear to start my fervent search for reasonably priced plane tickets and hotel accommodations. From that moment, we only had 20 days until we left for London. T-W-E-N-T-Y! I haven't been that spontaneous in my entire life. What a rush! Luckily I was able to find tolerable flights and remembered we had some Marriott points to burn, so that was settled. 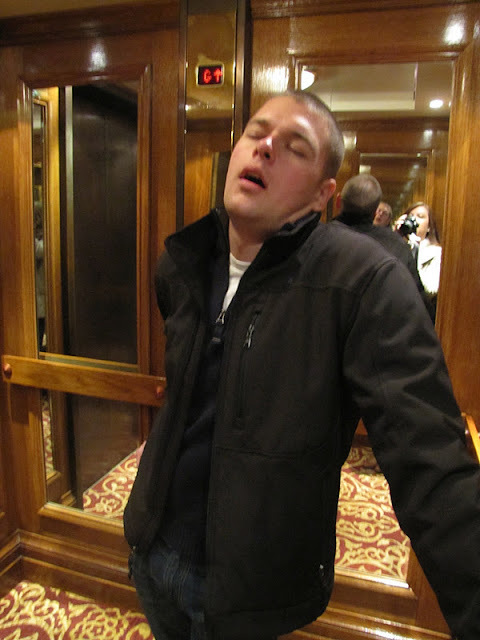 All that was left to do was wait to hear if we had gotten tickets to the Michael Bublé show. Sadly, the closest we got was an offer for stand-by tickets and that just wasn't worth the headache. Nevertheless, the trip to London was happening and we were going to enjoy an evening at a TV show taping! Yippee! Truth be told, I've never been on TV. I also hate being videotaped on anyone's camcorder. I will run away if you point that thing in my direction. Now a photography camera, I'll stand in front of all day. But, I digress. I don't know why I thought going to a TV show taping would be a nice, relaxing night of enjoyable performances. With the luck we tend to have, I pictured us sitting in the nose bleed section peeking through the bouffant hairdo of the lady in front of us. This arrangement couldn't have been farther from reality this past Friday night. We sat front row. Front and center. Why? Well, apparently it's because D and I are two of the prettiest American's two shamelessly gay studio producers had ever seen. My smooth complexion, perky hair, and white teeth...and D's "Abercrombie esque" good looks and bulging biceps (seriously, this is what these boy's told us) scored us front row seats. One of the producers also asked D if he was single. HELLO!! Wife standing right here!! Brits are bananas. Walking into the BBC station, all of the British folk were trying to put on their best American accents so they could have prime seating too. This was, after all, a taping for an American TV show. 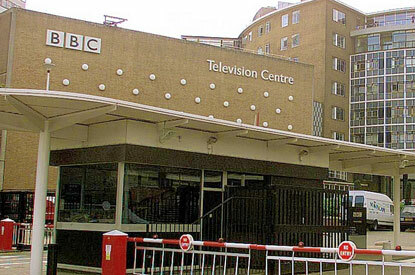 This is the BBC White City studios. This photo is of exactly where we walked in and went through security. So, they slapped orange wristbands on our arms and shuffled us into the waiting room of the studio. I should have realized what kind of night we were in for when they offered us free wine and beer the second we stepped foot in the door. I could have used 3 glasses of vino when all was said and done. After waiting forever, we finally were led into the taping studio. I'm not quite sure what I was expecting it to look like, but the stage, lights, video screens...it was all what you see on TV! We sat down in our front row seats and some studio lady came and asked us where we were from and if we'd ever done anything like this before. We promptly responded, "America and no way," to which she said, "Oh goodness! You're in for a treat! By the way, you'll likely be on TV. A lot!" Um, ok lady. Way to freak us out! D and I immediately started grooming ourselves like monkey's, picking lint off his head and putting lip gloss on my face. I really didn't know what to do with myself! Finally, the MC of the night came waltzing in (also know as the guy who comes into the studio before the celebrities to get the audience hyped up with stupid clapping games and dancing). He gave us the rules for the evening, did his 'get hyped up' routine, then started introducing the improvisors, the show host, and the guest celebrity for the evening. Out walks Brad Sherwood (cool! ), Colin Mocherie (sweet! love him! 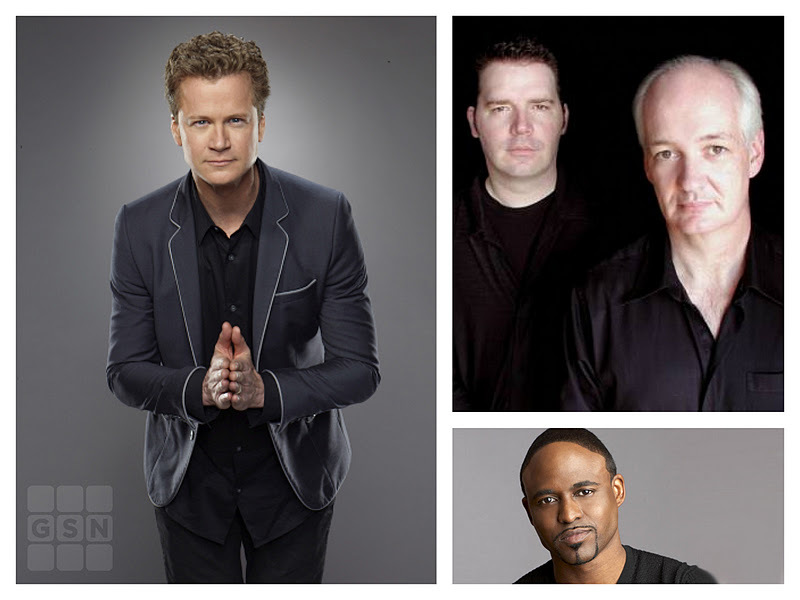 ), Jonathan Mangum (he's Wayne Brady's right hand man on Let's Make A Deal and a really funny improv guy, awesome! ), and...drumroll...WAYNE BRADY (*$&%^ DIED!)!! My hands couldn't clap fast enough! I love all of these guys, especially Wayne Brady! I mean, really. He's Barney Stinson's bro on HIMYM. What's not to love?! Then the host, Fred Willard, and the special celebrity guest, Jerry Springer, made their way on stage. It was time to start the show! The show was insanely funny. It really was exactly like Whose Line?, but with the added component of a special celebrity guest who tells funny and poignant stories about events in their lives while the improv guys act them out. And the stage lady was right, we are definitely going to be on TV. One of the cameras sat right in front of our faces for at least 30 minutes out of the 3 hour taping, with the camera guy looking in the camera and up at us through various times in the evening. Not kidding. At one point, the camera in our faces was completely blocking everything we could see on the stage, so we just continued to smile and laugh with cues from the audience behind us. How bananas is that?! We were totally fake laughing! The MC told us they would be taking lots of footage of the audience clapping, laughing, smiling and just plain enjoying themselves. There was no telling when that footage was going to happen so you had to be ON the WHOLE TIME. Smiling, clapping, and laughing like a nut job in a psych ward. That's exactly what it felt like. Not to mention, the achy neck, back, hands, and face. I've never smiled that much or sat up that straight in my life!! Oh and no water or bathroom breaks. Did I mention that we hadn't had the chance to eat dinner before the show? We had lunch at 1pm then nothing till we ordered room service when we were back at our hotel at 11pm. At the end of the taping, I was pretty much incoherent. Except for when I caught Wayne Brady's attention and it landed me a lingering handshake! Oh, and he called me sweetheart. That moment, right there, made all the pain of being an audience member for a TV show taping worth it! This is what the stage looked like! You can see Colin Mocherie and part of Wayne Brady! Fred Willard is in the chair in the back. This is seriously what we felt like after the show. Death warmed over. 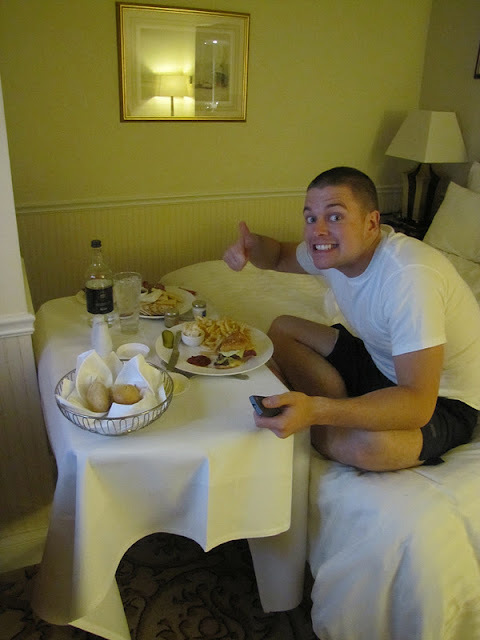 SO thankful for 24 hour room service! That burger saved our lives! In all honesty, I'm glad we did it. First of all, it brought us to London. Second, we're going to be on TV, no doubt about that. And third, we got to be chummy with celebrities for 3 hours of our lives (sitting front row, we got to exchange a lot of looks, laughs, and "seriously, another take?" comments with each other)...and I got to touch Wayne Brady! Worth every minute. I know most of you are wondering when this super awesome TV show is going to air, right?! Well, I've got no clue. We totally forgot to ask before we left the studio. Sorry! I was still shaking the stars out of my eyes when we left! But, I've been in contact with the studio and they said they'd let us know when it will be airing on ABC. So, when I know, you'll know! Believe me, I want to see what kind of idiot I made of myself just as much as you guys do! Did I mention they told us they were filming in HD? Yeah, I may be getting botox after this thing airs, just FYI. OOOOOO that sounds amazing! and totally fun! i'm sure you looked just great! Super cool! Sounds like a lot of fun! holy cow! what an amazing experience! man, i need to be on the lookout for stuff like this. keep me in the loop, will ya? glad you found me. I'll definitely be keeping up with you. are you guys in ramstein? Sure will, Michelle! We are stationed in Wiesbaden, actually. Very nice here! Where are you guys?